We also offer a limited warranty for your denture, at no additional cost to you. We want you to feel confident not just with your new smile, but with the materials and workmanship of your denture or partial. During the Warranty period, which begins on the date your final denture is delivered to you, the dentist will repair any breaks or damages that might occur as a result of our work - free of charge. 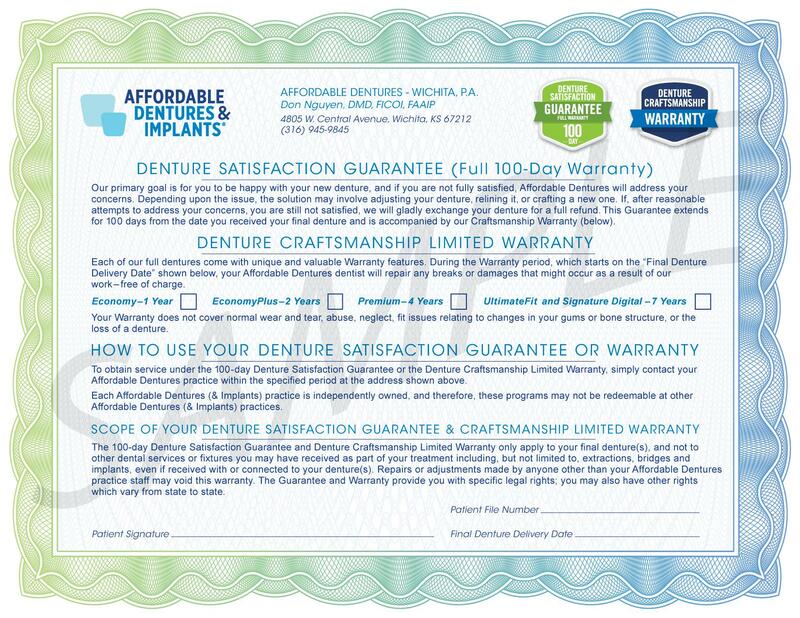 View our certificate using the link here for terms and conditions on our Denture Craftsmanship Limited Warranty. Our 100-Day Denture Satisfaction Guarantee tells you that the dentist, staff and lab technicians at Affordable Dentures stand behind our work. Your denture was hand-crafted with care by our lab technicians, right here in Wichita, KS. If you're not fully satisfied with your denture, we'll address your concerns and make it right within the first 100 days. Depending on the issue, we may need to adjust your denture, reline it or craft a new one. If you're still not satisfied, we will gladly exchange your denture for a full refund. View our certificate using the link above for more information about our 100-Day Full Denture Satisfaction Guarantee. If you have any questions, please call us at 316-453-9831. Please fill out the form below to request an appointment. For immediate assistance, please call us at 316-453-9831.